So we like to go out to eat…probably more than we should. BUT I wholeheartedly think that trying new foods from different places is necessary to do what I do. I have this culinary ambition to try literally everything, so I think I use that as an excuse to get take-out more often than the average joe. I have found some amazing inspiration in my travels. Even if my travels take me 20 miles away. You find hidden gems among you, I’m telling you. I know that chain restaurants can have some seriously delectable treats and are some of the most popular recipes that are copied. Take this Applebee’s Honey Pepper Chicken Mac and Cheese (most pinned recipe on my site). Or this Olive Garden Chicken Gnocchi Soup. Or even these Texas Roadhouse Rattlesnake Bites. As you can see I am a fan of copycat recipes. Well my newest isn’t so much as a copycat as it is a twist on something I love. There is this restaurant near me called Grizzly’s Woodfire Grill. It’s your average run of the mill restaurant, they have the normal burgers, steaks and pastas. 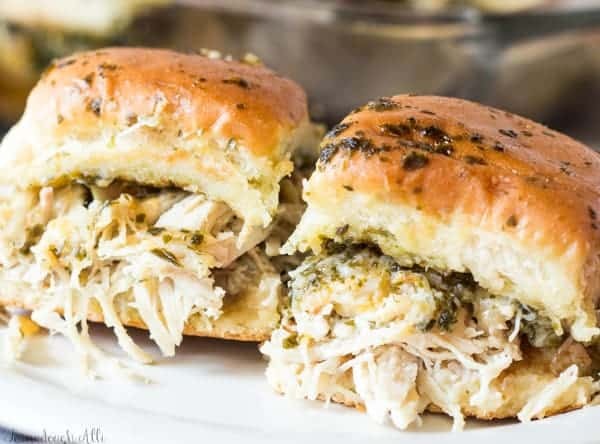 My absolute favorite thing on their menu is there Honey Basil Chicken Sandwiches!! It’s like a burst of flavor in your mouth. So I took it upon myself to give it a little twist. While I have made the actual large sandwich version myself, there is something about sliders that I adore…I feel I can have more of and it’s just fun! 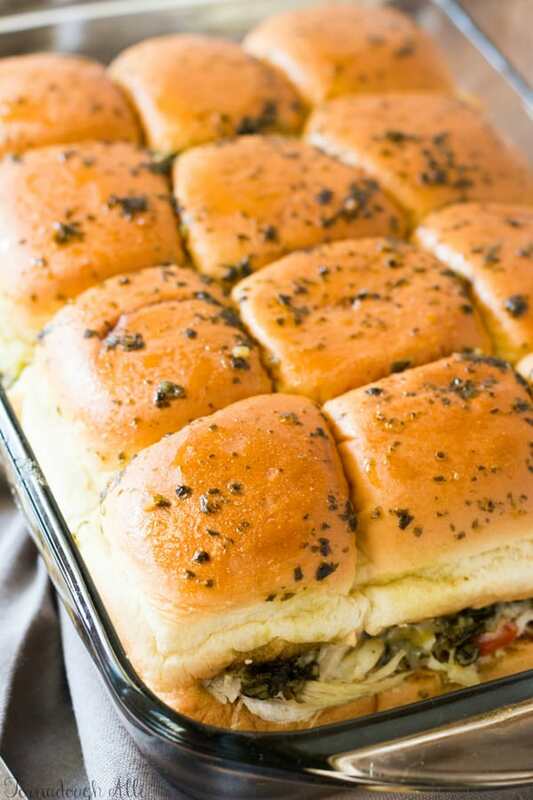 So say hello to these Honey Basil Chicken Sliders. 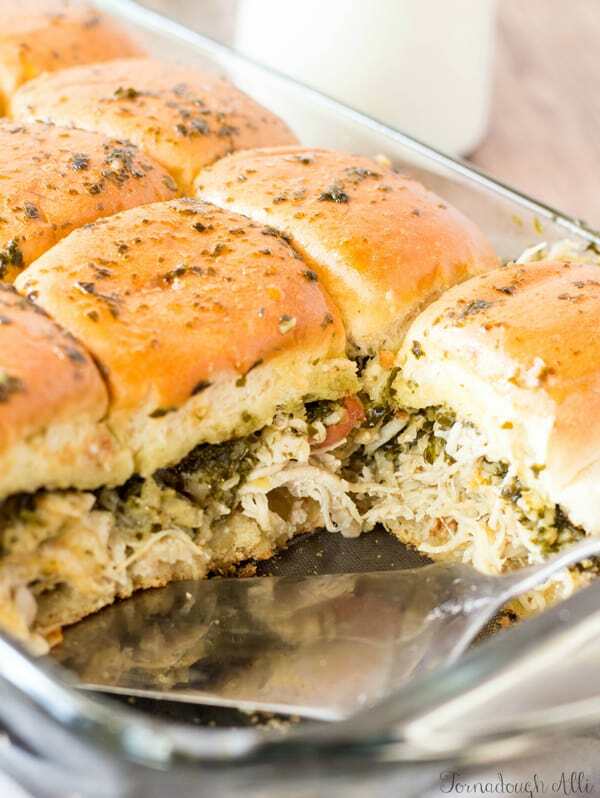 Shredded chicken breasts are topped with diced Roma tomatoes, a honey pesto sauce, and all topped with a 2 cheese blend. Simple right?!?! I cannot tell you how tasty the honey pesto is. If I could have my pesto any way…it would be with honey. It balances out the earthy flavor of the basil and gives it a sweet flavor that just lingers in your mouth. Seriously amazing. Sorry, I can’t say that enough. 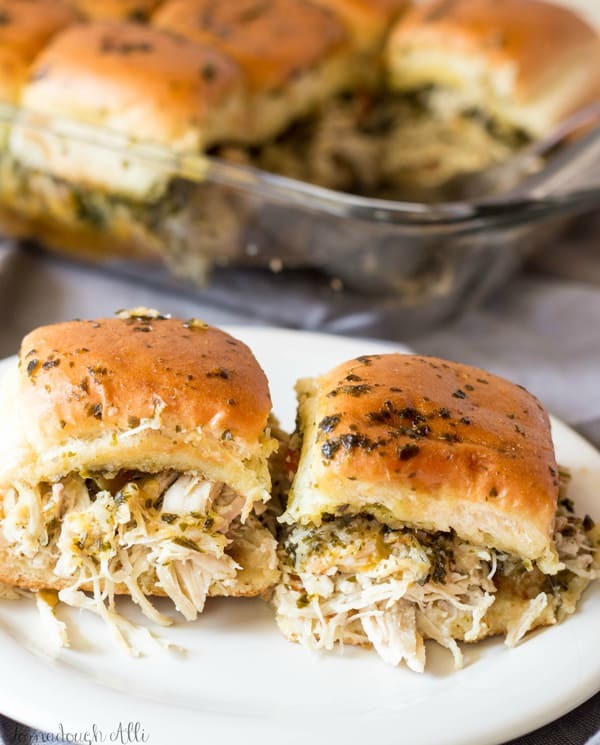 You pop these little handheld bites of heaven in the oven for about 25 minutes and you have yourself an easy, tasty meal that the whole family can enjoy. My husband has now become a pesto lover, where in the past he was so leery to trying the stuff. BUT I have made him more of a food adventurer now, so I think my work is complete! 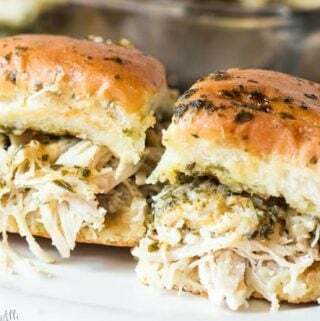 If you’re looking for a different type of sandwich to serve at your next game day these Honey Basil Chicken Sliders are it! Trust me when I say there wont be any leftovers…which is sad, because you probably will want to keep eating them. Good thing they are simple to whip up!! 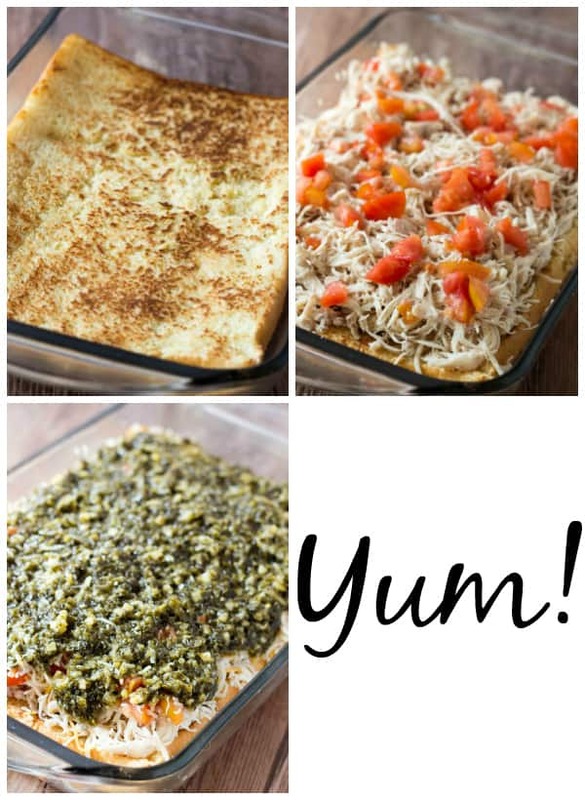 Shredded chicken is topped with sliced Roma tomatoes, honey pesto and 2 cheeses and baked until hot and melty. Split your slider buns and toast on griddle, or in oven until browned (optional). Spread your chicken on bottom layer of buns and top with diced tomatoes. In bowl mix together your pesto and honey, spread over your chicken, reserving a Tbs or two. Sprinkle with your cheeses, top with other half of slider buns. Brush tops of buns with remaining pesto mixture. Cover and bake for about 25 minutes or until cheese is melted. It’s too bad the recipe itself is in such a light color. Makes it very difficult to read. Thanks for pointing that out for being a problem Jeanne, I have since changed the font colors to black so it’s easier to read! These look really good. I love slider sandwiches. This is especially true for potluck dinners and other events. SO delicious!! Even my picky 2 year old loved them!! Thank you!! I’m so happy you loved these, one of our faves! I have never tried freezing these but I probably wouldn’t recommend it. Do you think diced red bell pepper might be good in these instead of tomato? I have never tried it with that but you can absolutely add it to your liking if you are not a tomato fan!